Bryan practices physical therapy at the UW Health Sports Rehabilitation Clinic and specializes in the treatment of patients with running-related injuries. 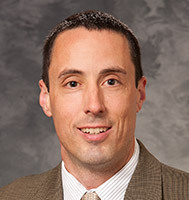 He is the director of the Runners Clinic and an associate professor in the Department of Orthopedics and Rehabilitation at the University of Wisconsin. Bryan is a member of the Wisconsin Physical Therapy Association and the American Physical Therapy Association. He is licensed by the state of Wisconsin for physical therapy. Bryan sees patients upon referral and through physical therapy direct access (self-referral). Bryan holds a Bachelor of Science degree in Physical Therapy from the University of Wisconsin-La Crosse and a doctorate in biomechanics from the University of Massachusetts. Dr. Heiderscheit is the co-director of the University of Wisconsin Neuromuscular Biomechanics Lab, which conducts research on the biomechanics and neuromuscular coordination of human movement, with particular focus on running-related injuries.